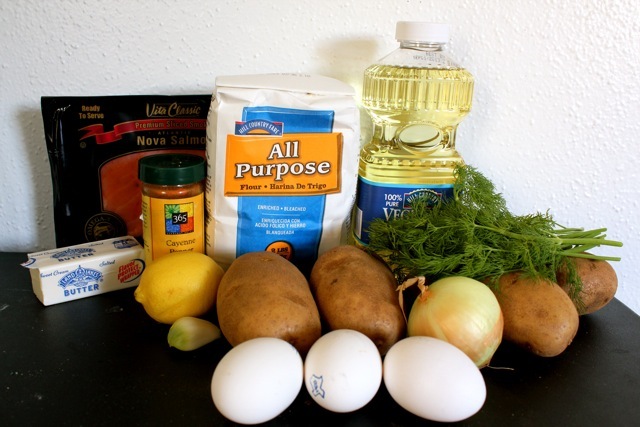 First up, let’s make latkes! Start by shredding your potatoes. 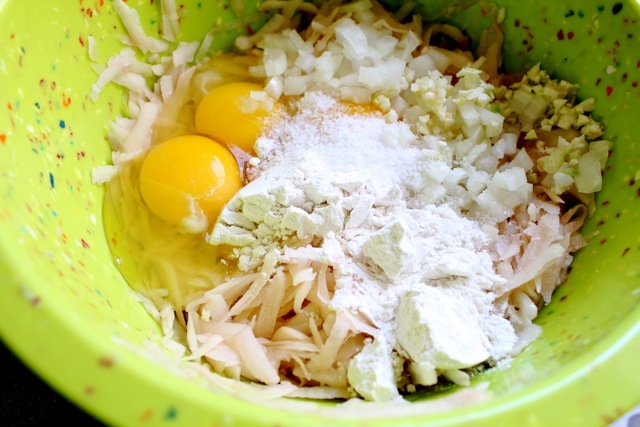 Ring out all the moisture with a paper towel and then add in the onion, eggs, garlic, flour and salt and combine. Meanwhile, heat up canola oil in a large saute pan. Scoop two tablespoon dollops of the potato mixture and fry until golden brown, about 3-5 minutes. Then flip and fry the other side. Drain on a rack over paper towels. 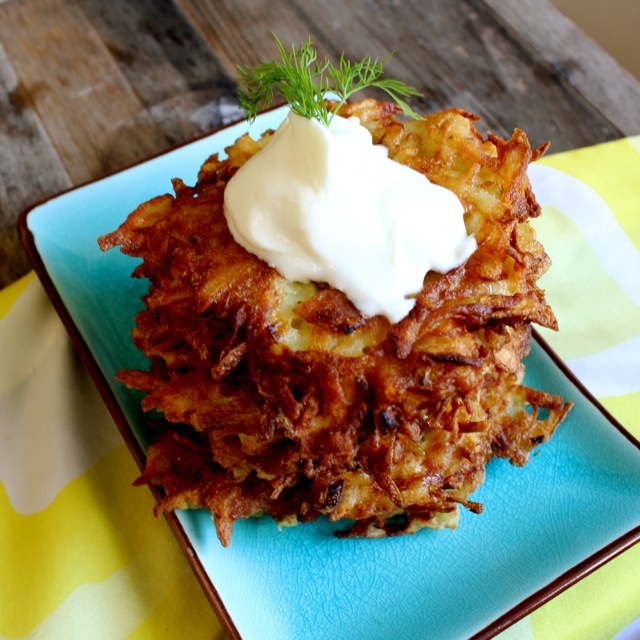 Now you could serve these with sour cream and applesauce and I’m sure Hanukkah Harry would be satisfied. More than satisfied actually. But let’s blow him out of the water, shall we? 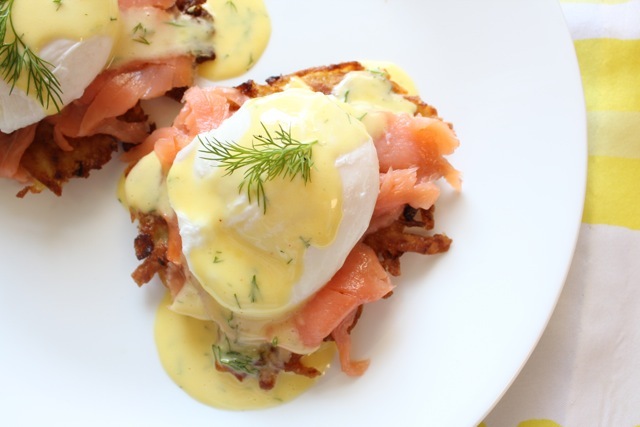 To make your latkes into Benedict latkes, start with poaching eggs. Bring a few inches of water to a simmer (NOT a boil) in a large sauce pan. Add a splash of vinegar (this helps the egg form together). 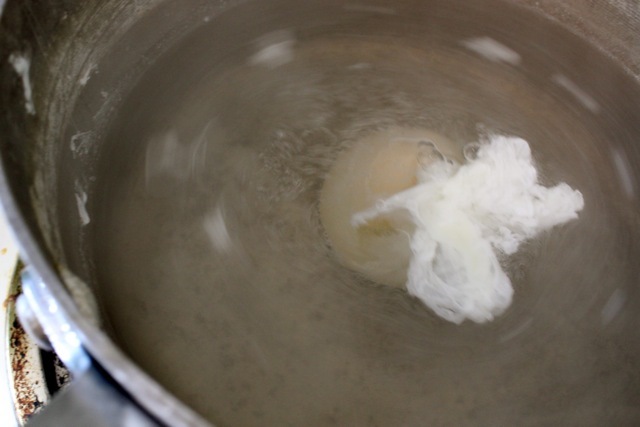 Then whisk water in a circular fashion (also to help the egg form). Crack egg into a ramekin and and gently pour into the middle of the pot. That’s pretty much it! You know it’s done with the white is just set and the yolk is still runny (Gently press on it to check). Then remove with a slotted spoon and pat dry on a paper towel. Let’s start plating! 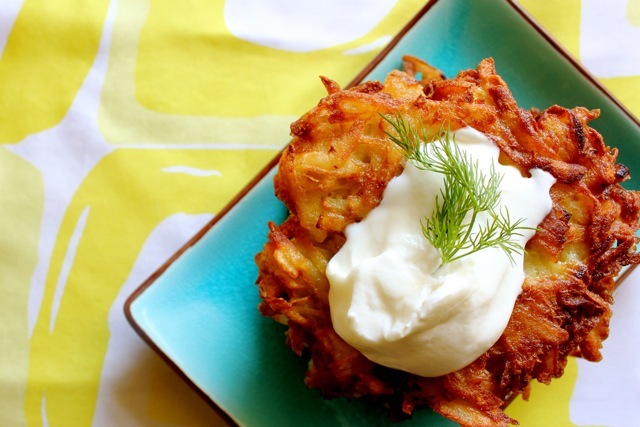 Top latkes with lox and then a poached egg. 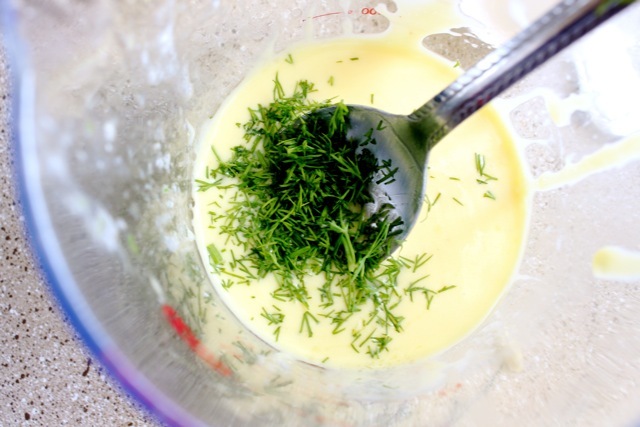 Now let’s make the Hollandaise- it’s easy in a blender! 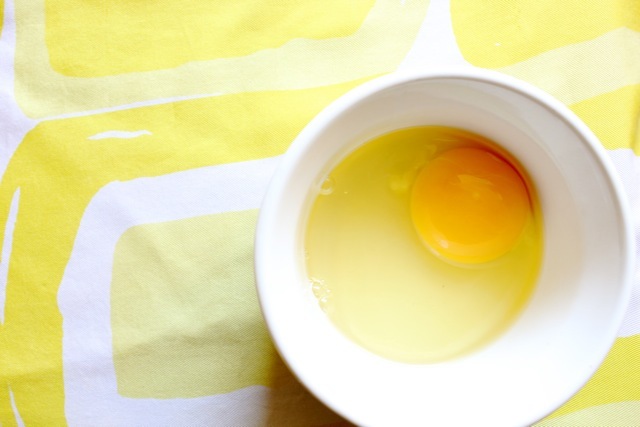 Start by pulsing 1 egg yolk, lemon juice and a pinch of cayenne. Then drizzle in hot butter while blending until sauce is formed. Season with salt and dill and drizzle over eggs. 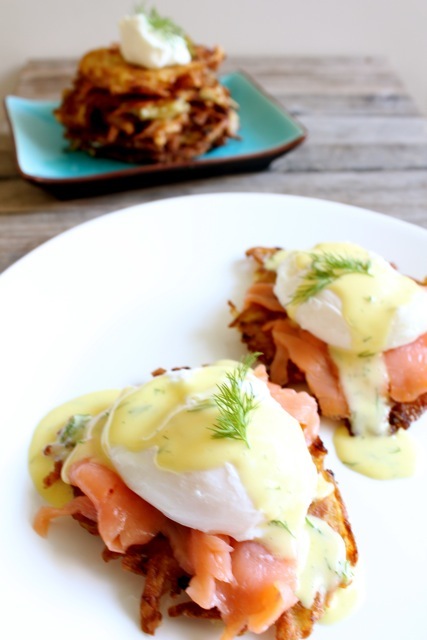 A Benedict twist on potato latkes for Hanukkah- plus how to poach eggs and make Hollandaise sauce! 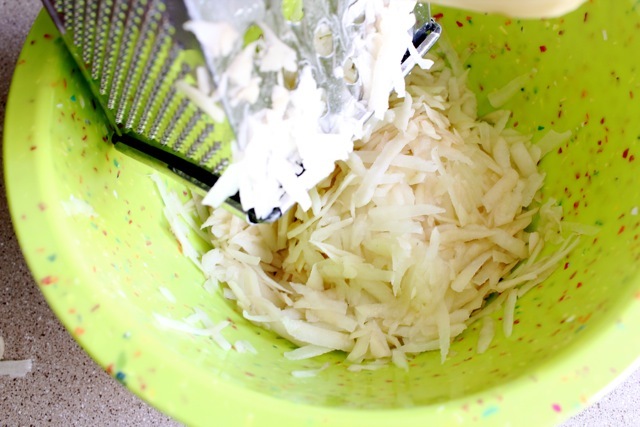 Start by shredding your potatoes with a grater into a bowl of ice water. Let sit for 10 minutes. Remove potatoes, squeezing out the moisture into the water. Dry potatoes very well with towels. 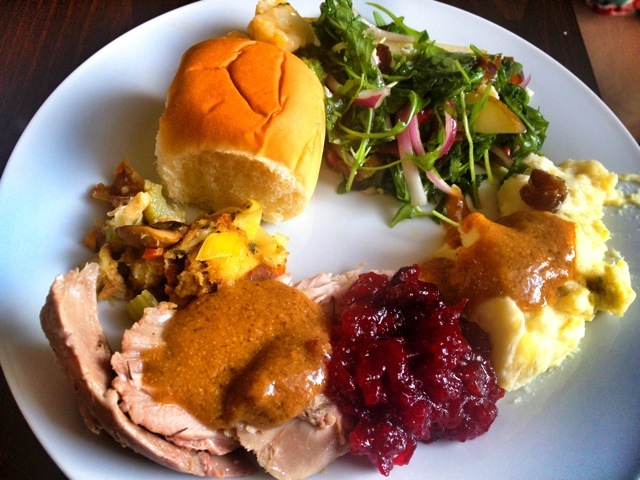 Let water sit 10 minutes for starch to accumulate on the bottom. 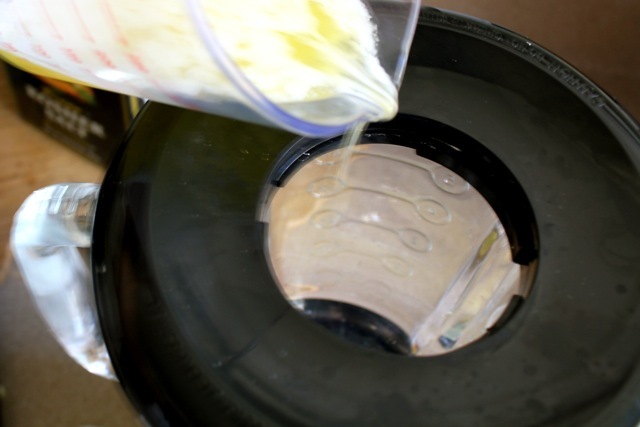 Carefully drain water, reserving the white starch on the bottom. Place potatoes in a large bowl, dry again very well. Then add in the onion, eggs, garlic, flour and salt and reserved starch and combine. 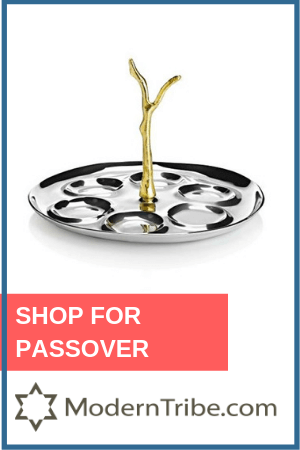 Meanwhile, heat up canola oil in a large saute pan. 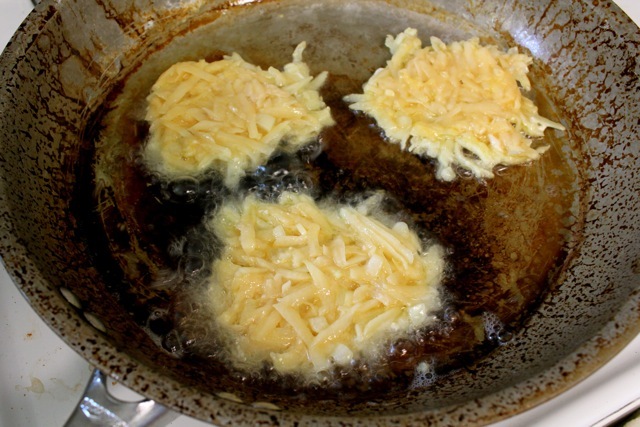 Scoop two tablespoon dollops of the potato mixture and flatten lightly and fry until golden brown, about 3-5 minutes. Then flip and fry the other side. Drain on a rack over paper towels. That’s pretty much it! You know it’s done with the white is just set and the yolk is still runny (Gently press on it to check). Then remove with a slotted spoon and pat dry on a paper towel. Repeat with other eggs. Let’s start plating! 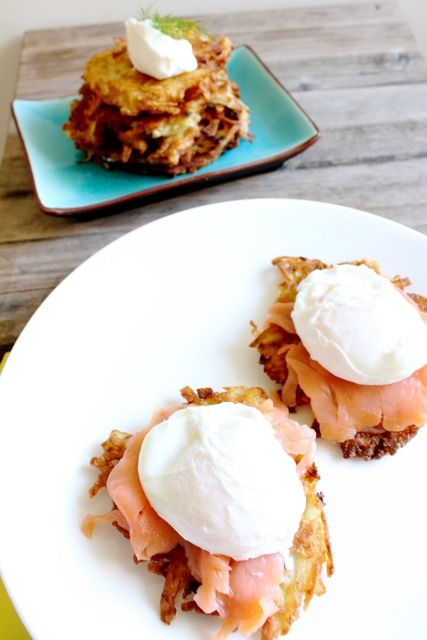 Top latkes with lox and then a poached egg. 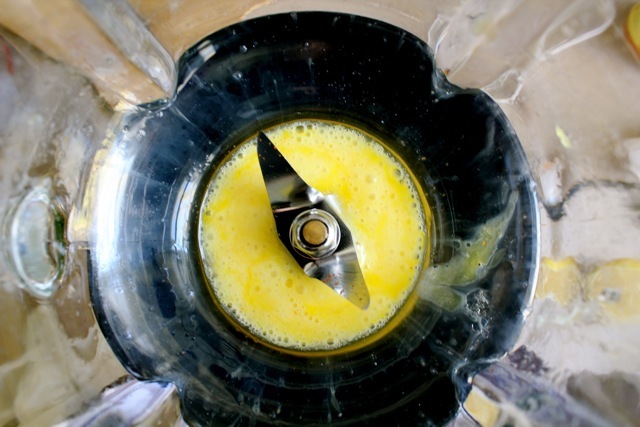 Now let’s make the Hollandaise- it’s easy in a blender! Start by pulsing 1 egg yolk, lemon juice and a pinch of cayenne. Then drizzle in hot (but not boiling hot) butter (I melted mine for 60 seconds in the microwave just before making the sauce.) while blending until sauce is formed. Season with salt and dill and drizzle over eggs. 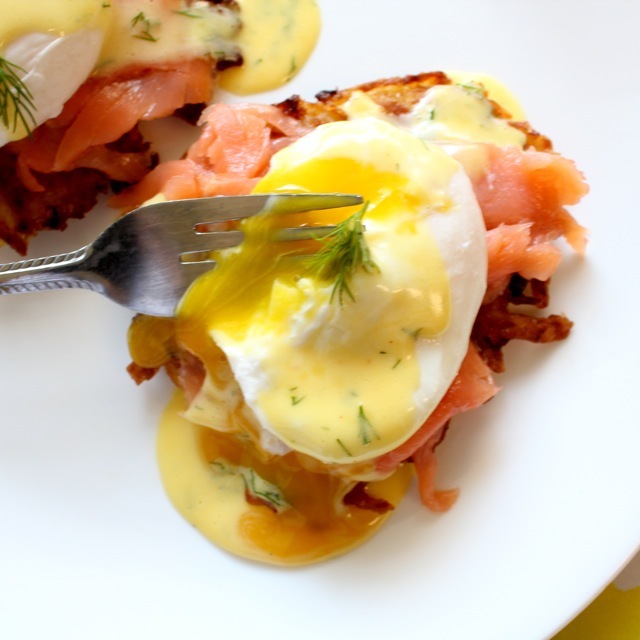 Eggs Benedict is one of my favorite things! 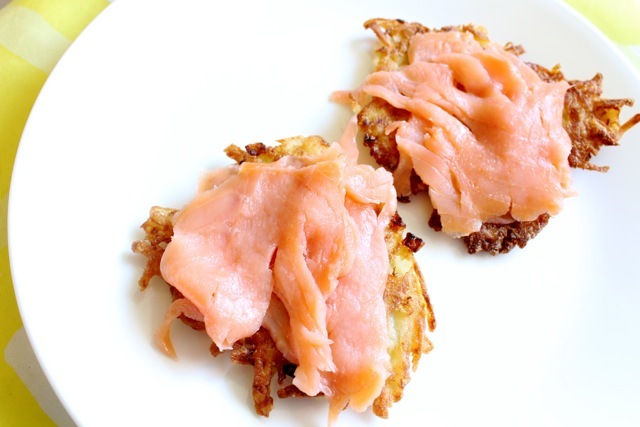 I love the lox and latke substitution ideas! Looks amazing! Amy – I’ve just discovered you. 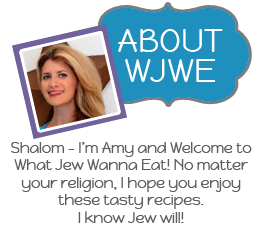 This looks like a really fun site! 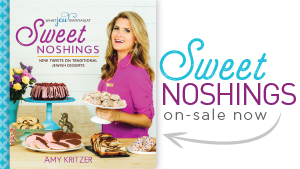 I’m looking forward to looking around and trying some recipes. Thanks, Leah! 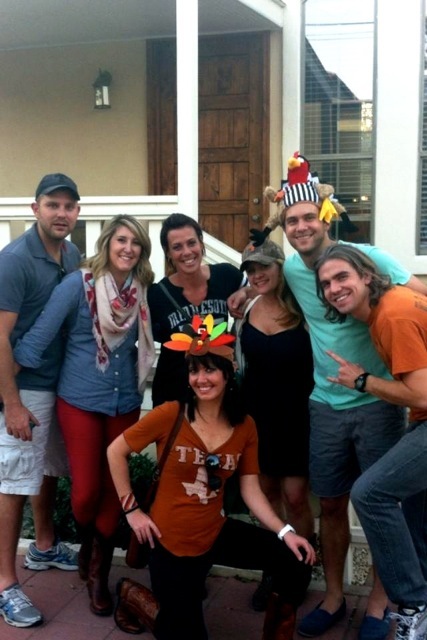 And thank God I have photogenic friends. Eggs Benedict is one of my favorite things. 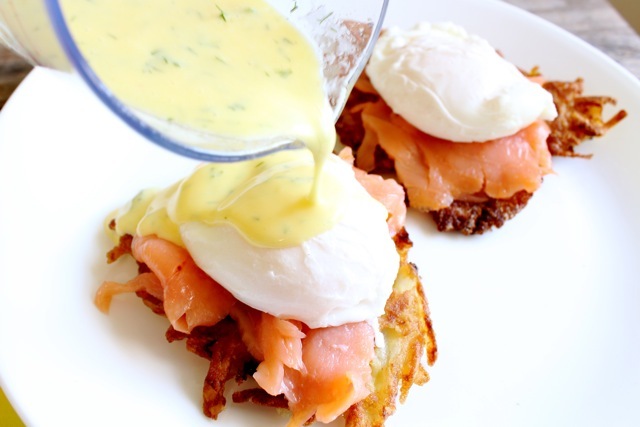 Hollandaise might be acceptable on just about anything. You have two benedict-y things in one week and I can’t stand it! Ha that wasn’t the plan but I just couldn’t help myself! This was delicious. I had to double it to feed more, but we are now all enjoying a well earned (at least for me) food coma. Oh my gosh that method of making hollandaise looks so much easier than carefully stirring it on the stove while praying that it doesn’t separate. 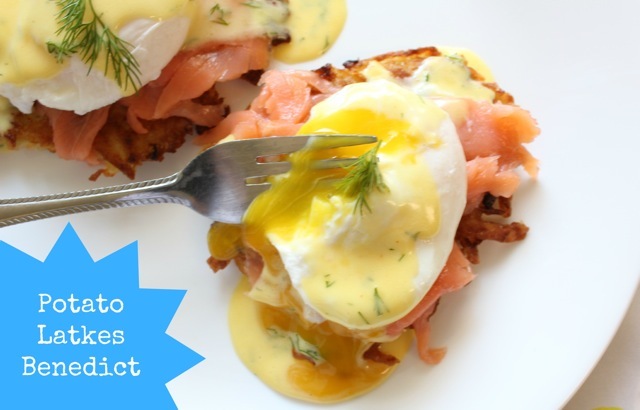 I’m making your recipe for Lox tonight and hopefully making this for breakfast this weekend. Thanks! It is easy! 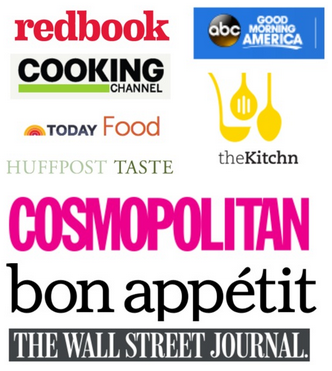 They taught us the real way in culinary school, and then the restaurant “cheat” way. Enjoy! 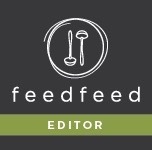 How may the reserved starch from the potato water be used? 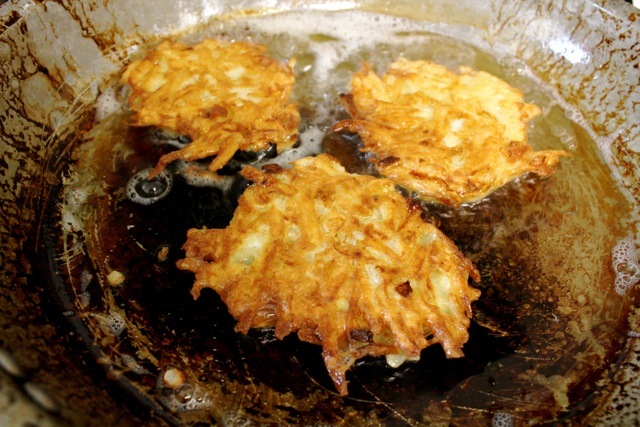 You actually add it back into the latkes! Sorry if that was confusing. I updated the steps a bit.